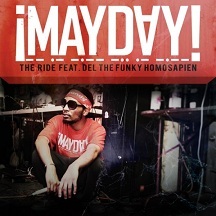 The Miami menace known as ¡Mayday! continues to make waves this week with the release of their new single, “The Ride“. Looking to Del The Funky Homosapien for the assist, the collaboration is beginning to build a heavy buzz for the band who recently signed to Strange Music. DJBooth.net recently released its “Independent Music Chart”, which compiles the most popular independent releases based on views and ratings. “The Ride” comes in at #10 this week, ranking above several releases from Omar Linx, Treehouse, and Ka$ual. Currently on Tech N9ne’s All 6’s And 7’s Tour, ¡Mayday! is still catching the industry by surprise, and with releases like “The Ride”, they’ve shown they have plenty more in store.